You’ll also hear about ... why this whole idea isn’t quite as ridiculous as it sounds. Yes, the idea is definitely less ridiculous than trying to understand people's behavior in hypothetical, policy relevant situations. Update: I haven't splurged on that expensive meal yet. Dealing with global warming will be expensive. The price tag last year for the drought was about $35 billion, according to the reinsurer Aon Benfield. Hurricane Sandy cost a further $65 billion. The National Oceanic and Atmospheric Administration said that last year ranked as the second-costliest in terms of natural disasters since 1980 — lagging only 2005 when Hurricane Katrina swamped New Orleans. And yet this is nothing compared with what the future will bring. “The impact to date has been pretty small,” said William Nordhaus of Yale, one of the leading economists studying the impact of climate change. The president’s speech notwithstanding, the cost of dealing with these looming disasters is not to be found in the budgets discussed by the White House and Congressional Republicans, which would shrink much of the government to its smallest share of the economy since the early 1960s. Neither is the cost of steering the economy away from the fossil fuels that are to blame for a warming atmosphere. A report from the World Economic Forum estimated that would cost $700 billion a year in public and private investment. The reluctance is not because we have no idea how to finance these efforts. We do. Top economists agree a tax on fuels and the carbon they spew into the atmosphere would be the cheapest way to combat climate change. [*editor note: see below] Most advanced countries rely on some variant of this tax. The question is whether the prospect of more droughts and more powerful hurricanes will push Americans to embrace it, too. Among the 34 industrialized nations of the Organization for Economic Cooperation and Development, these taxes average about $68.4 per metric ton of carbon dioxide. The United States, by contrast, has a gas tax to pay for highway improvement, and that’s about it. Total federal taxes on energy amount to $6.30 per ton. Some states add excise taxes — California has a gas tax equivalent to about $46.50 per ton of carbon dioxide and a $2.33-per-ton tax on jet kerosene. But, according to a review by the O.E.C.D., the federal government is unique in imposing no taxes on other energy use, from residential heating to power generation. A tax on energy could single-handedly take on climate change. For starters, it would encourage people and businesses to burn less, reducing emissions at a stroke. One study found that a carbon tax of $15 per ton would reduce greenhouse emissions by 14 percent as people sought to save energy by driving less, insulating their homes and switching to renewable fuels, among other things. What’s more, it would raise lots of money. Estimates reviewed in a report by the Tax Policy Center ranged from 0.6 percent of the nation’s gross domestic product — for a tax of $20 per ton of carbon dioxide — to 1.6 percent of G.D.P. for a tax of $41 per ton. Consider this: 1.6 percent of G.D.P. is $240 billion a year. And $41 per ton amounts to an extra 35 cents a gallon of gas. 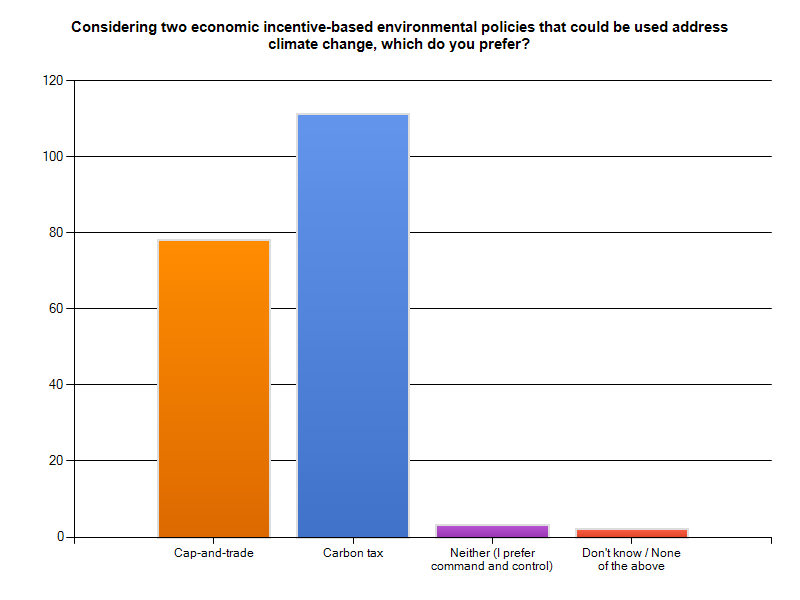 *Even run-of-the-mill economists prefer a tax (or cap-and-trade). New Orleans changing its NBA nickname from Hornets to Pelicans was not a secret. But the logo and color scheme was, until today. New Orleans on Thursday officially unveiled its new nickname, logo and color scheme, capturing the essence of New Orleans and the Gulf and spotlighting the ecological concerns of the region. The pelican, Louisiana's state bird, symbolizes the city and region's return from the devastating impact of Hurricane Katrina and reminds fans of two major issues: coastal restoration and wildlife conservation. The logo depicts a menacing pelican, wings spread, with a basketball under its beak, a fleur de lis and a font reminiscent of the Crescent City. The new colors are blue, red and gold. Suggest your own in the comments. A number of the nation’s leading conservative economists, who as a rule do not like taxes, are touting some benefits to a federal carbon tax. That group includes Gregory Mankiw, a former Romney adviser and George W. Bush-era chairman of the Council of Economic Advisors; Douglas Holtz-Eakin, Sen. John McCain’s 2008 chief economic adviser; and Art Laffer, progenitor of Reagan’s treasured Laffer Curve. So, why do some conservative economists who normally oppose new taxation support a carbon tax? Because a carbon tax, like any Pigovian tax, taxes something we want less of. And when you tax something, you get less of it. Even for the remaining cohort of climate-change deniers, Mankiw lists a slew of other downsides to carbon emissions in his Pigovian manifesto. ... most taxes, especially at the federal level, tax things we want more of: labor, investment, business activity. Depending on how broadly or narrowly you define economic growth, these taxes either arguably or definitely hurt growth. Liberal economists tend to like a carbon tax, too, but usually differ with conservative economists over what to do with the revenue. They’re more likely to see the revenue as an opportunity to extend government services, subsidize alternative energy, or, in the current economic environment, pursue some other form of stimulus. Conservative economists are more likely to advocate using the revenue to lower rates on other taxes, give everyone a tax rebate, or pay down the deficit. It’s these latter uses that are likely to dominate the discussion of a carbon tax in the coming months. If I'd prefer revenue be used to pay down the deficit, relative to lowering other taxes or subsidizing alternative energy, does that mean I'm a conservative economist? Yikes. A federal appeals court threw out a federal rule on renewable fuels on Friday, saying that a quota set by the Environmental Protection Agency for incorporating liquids made from woody crops and wastes into car and truck fuels was based on wishful thinking rather than realistic estimates of what could be achieved. Would the NRA support this government funded field experiment? In a recent piece in the Journal of Environmental Economics and Management, a bunch of authors (with complicated names)* show that asking survey respondents to swear a blood oath, or swearing on their mother's grave, or giving a pinky promise, or something like that, will increase the likelihood the respondent will tell the truth in hypothetical valuation situations. This is good news for all the mothers out there. Eliciting sincere preferences for non-market goods remain a challenge due to the discrepency between hypothetical and real behavior and false zeros. The gap arises because people either overstate hypothetical values or understate real commitments or a combination of both. Herein we examine whether the traditional real-world institution of the solemn oath can improve preference elicitation. Applying the social psychology theory on the oath as a truth-telling-commitment device, we ask our bidders to swear on their honour to give honest answers prior to participating in an incentive-compatible second-price auction. The oath is an ancillary mechanism to commit bidders to bid sincerely in a second-price auction. Results from our induced valuation testbed treatments suggest that the oath-only auctions outperform all our other auctions (real and hypothetical). 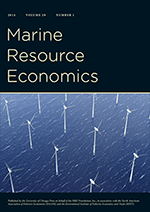 In our homegrown valuation treatments eliciting preferences for dolphin protection, the oath-only design induced people to treat as binding both their experimental budget constraint (i.e., lower values on the high end of the value distribution) and participation constraint (i.e., positive values in place of the zero bids used to opt-out of auction). Based on companion treatments, we show the oath works through an increase in the willingness to tell the truth, due to a strengthening of the intrinsic motivation to do so. But what if they cross their fingers? Being uncritical and a bit dim, I found the cartoon funny! Note the guy in the upper middle right panel who is eating a rock. While that's funny, McFadden forgets that international trade in agricultural products guarantees that this 99% dude won't have to eat a rock. His local supermarket will continue to be filled with tasty affordable stuff. It will just be grown elsewhere in the world as climate patterns shift. There is more truth to the rock than Matt acknowledges. Climate change will likely make the food less tasty and more expensive in areas where agricultural quality falls. But, adding to the criticism, lower income people in areas where climate change improves agricultural productiving might eat better at lower cost. Just thought this was awesome so I had to share. David Hodgkinson, former director of legal services at the International Airline Transport Association on airline opposition to participating in the EU Emissions Trading System.